In celebration of the 10th anniversary of Apple's iOS App Store, Sensor Tower has shared a list of the apps and games that have spent the most time in the #1 spot of the store's various charts. Looking at the period of time from July 1, 2010 to July 5, 2018, Sensor Tower's researchers found that a total of 30,000 unique apps have achieved #1 status on the free, paid, or top grossing charts in at least one country. Honing in the data a bit more, Sensor Tower found 422 apps that hit #1 on the top free iPhone apps chart in the United States during this period, and of those apps, Facebook Messenger spent the most days at #1 with a combined 317 days. 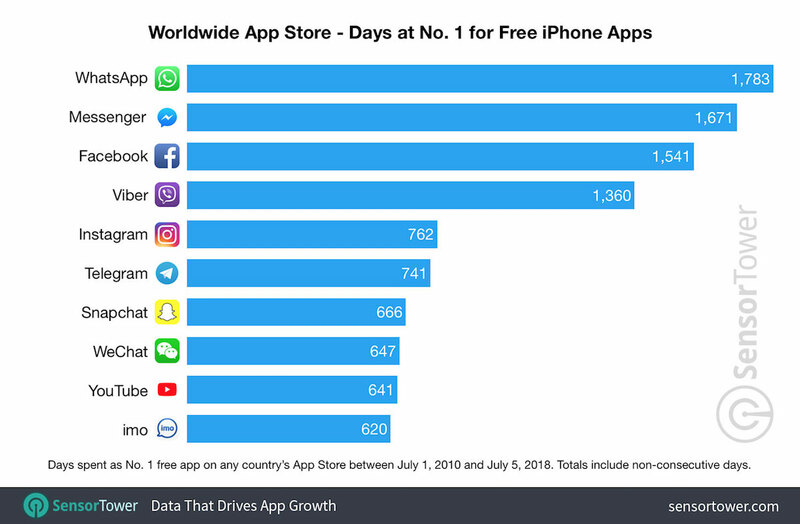 Worldwide, WhatsApp earned the top spot with a combined 1,783 days at #1 for free iPhone apps. 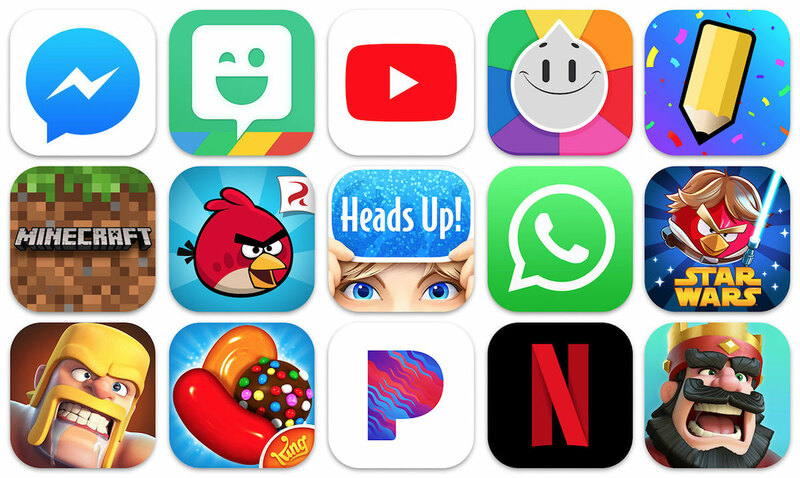 Popular apps in both the U.S. and worldwide for these charts included Snapchat and YouTube. 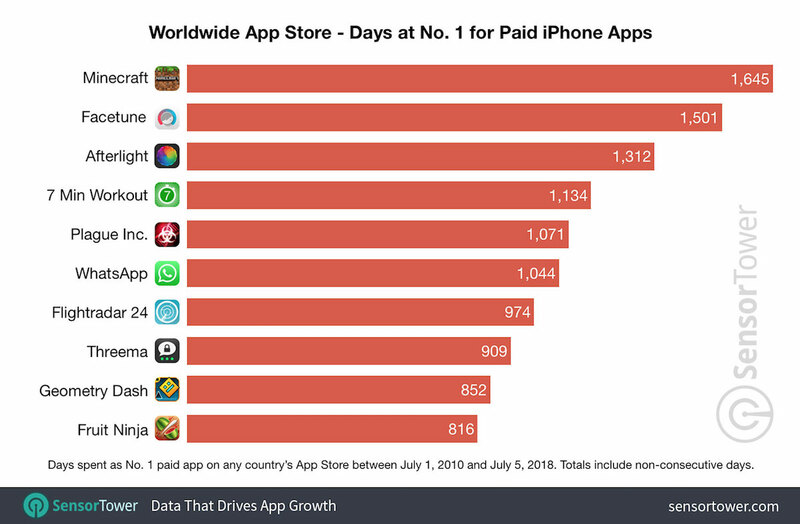 Looking at the amount of days at #1 for paid iPhone apps, Minecraft had the most days both in the U.S. (847 days) and worldwide (1,645 days) App Stores. Games were popular in the U.S. on the paid iPhone apps chart, also including Angry Birds (311 days), Heads Up (225 days), and Where's My Water (47 days), but globally there was more of a mix with apps like Facetune (1,501 days), Afterlight (1,312 days), and 7 Min Workout (1,134 days) rounding out the top four spots under Minecraft. Clash of Clans spent 805 days at #1 on Apple's top grossing iPhone apps chart in the U.S., coming in far ahead of the second place app Candy Crush at 278 days. The only non-gaming apps on this chart were Pandora (202 days), Netflix (172 days), and Spotify (61 days). Worldwide, Clash of Clans held onto the top spot with 1,900 days, while Spotify also remained in the top ten with 1,047 days spent at #1. The App Store officially launched on July 10, 2008 with 500 apps for iPhone 3G owners to download, 75 percent of which were paid downloads. Over time the App Store grew and expanded, introducing in-app purchases, apps for the iPad, subscriptions, revamped interfaces, and more. Most recently in iOS 11, Apple introduced editorialized content on the App Store's home page with articles and features that highlight new and interesting apps and games every day. For more on the ten-year anniversary of the iOS App Store, be sure to check out our retrospective that dives into the big events that hit the App Store over the past decade. It just show how much people care about their privacy. Four of five top free apps owns Facebook.